If you’ve ever traveled on I-90 or I-29 through South Dakota, you’ve likely noticed the 75 mph speed limit signs and the multitude of motorists who blow right by them at a minimum of 80 mph anyway. Maybe you’re one of those speed demons in the passing lane on your way to the Sturgis Rally, or maybe you’re watching license plates cruise on by you. 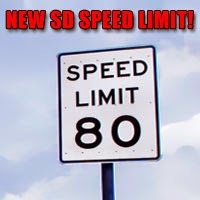 Either way you’ll want to listen up, because an amendment to South Dakota Senate Bill 1 passed Tuesday, effectively changing the speed limit on the state’s two interstate highways. When the new law takes effect on April 1, you’ll legally be able to travel at 80 mph. The bill passed also incorporates a one percent increase in the motor vehicle excise tax, a 20 percent increase in license plate fees, and an increased gas tax of 6 cents per gallon, which will go to improving roads and bridges. So, all you lead foots don’t have to spend as much time watching your mirrors for the fuzz, and you Sunday drivers can twist the throttle a little farther…if you want to, that is.